It's has been a little while, I wanted to let you know what's been happening with the record and alert you to a special show I have on Thursday. On Thursday, December 13th, the Sam Boshnack Quintet will be giving a concert at The Frye Art Museum. This is part of an exhibit happening there right now called Mw [Moment Magnitude] - "an ambitious cross-platform project of visual art, performance, production, rehearsal, specially commissioned artworks, music, dance, literary events, design, and arts engagement programs showcasing exceptional artistic practice in Seattle." I am so excited and honored to be a part of it The Frye Art Museum performance will feature eight original works for the Quintet featuring myself (trumpets), with Beth Fleenor (clarinets/voice), Dawn Clement (keyboard), Isaac Castillo (bass), and Max Wood (drums). There is also going to be an amazing light exhibit illuminating the show by Lillenthal/Zamora. Also on display are graphic musical scores of Eyvind Kang, a sound installation by Robb Kunz in the reflecting pool from which will emanate the music of Jherek Bischoff, and much more. Okay, now for record updates. One of the 8 songs we recorded at Bear Creek was a piece I wrote for the singer Megan O'Donoghue Williams. The words of the piece were from a traditional Javanese poem called Pangkur. Megan moved to Surakarta on the island of Java in Indonesia before I had the chance to record her vocals. She is currently living over there and has a very successful career singing in Wayang (shadow puppet) performances all over Java. So on November 13th I flew to Indonesia to record Megan. I wanted to learn more about Indonesia and its music, and it felt special for myself and the piece to record her actually in Java. 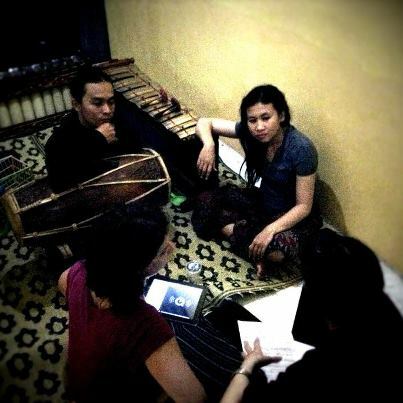 I also wanted to bring more Indonesian musicians and instruments into the piece and I did - Sri Joko Raharjo who played rebab (a gamelan two-stringed instrument) and gender (a gamelan pitched percussion instrument). 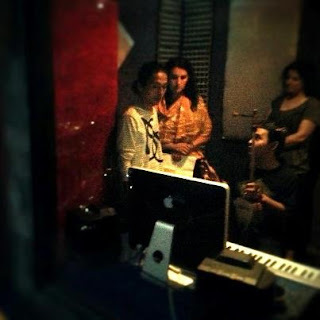 Peni Candra Rini (an incredible vocalist and composer) coached Megan with pronunciation and interpretation help. The night before we went into the studio Megan threw a party and we had a rehearsal for the piece. New ideas were brought in for the improvisation section by the four of us and it was very excited to brainstorm about it. Lots of other people were there from the community listening. The next day we laid down the tracks and I'm happy to say the whole thing was a great success. On Friday, December 21st I will begin mixing the record, I will let you know how that goes. Can't wait for you all to hear it! P.S. - Two close friends and musicians came with me, and I'm so glad they did - Valerie Holt and Anne Mathews. 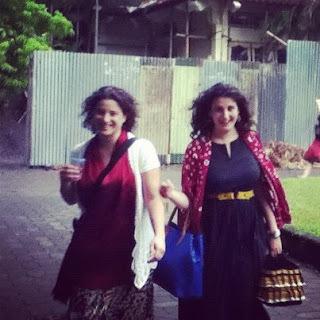 We also had many non-recording adventures traveling around Java and Bali - it was a blast.